A quick view of the most influential metrics in Sapphire NC. Back in the 1880's, Sapphire Valley was the nation's leading gold producing area until the California Gold Rush. The Georgetown mine, located at the foot of Bald Mountain, produced some sizable gold nuggets, but eventually closed its doors and the area became a great place for tourism. Today, visitors to Sapphire Valley enjoy the beautiful waters of Fairfield, Hogback and Whisper Lakes where they can canoe, kayak, and fish. 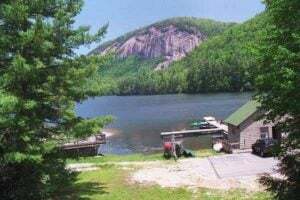 The banks of Fairfield Lake is also the place to be on the Fourth of July for the annual Symphony Under the Stars and fireworks and is the home of Camp Merrie Woode, one of the premier children's summer camps in the North Carolina Mountains. There are great trails to the top of Bald Rock and horseback riding is available close by. Although golf is the king of sports in the summer months, when winter rolls around, skiers and snowboarders find their way to the Sapphire Valley Ski area and Frozen Falls Tube Park. View our selection of available properties in the Sapphire NC area. Check out the latest demographic information available for Sapphire NC. Browse through the top rated businesses in the most popular categories Sapphire NC has to offer.